What to do if my dog is afraid of fireworks? Loud noises are a part of life, and while we can’t always prevent our dogs from developing phobias, we can do our best to desensitize them to random noises throughout the year. These noises could be motorcycles, train whistles, horns, fireworks – you name it. The rescue I work with said the Fourth of July is one of the busiest times for pounds and shelters because so many dogs get scared of fireworks and bolt from their owners. This is a good example of why we should be desensitizing our dogs to loud noises during every season, not just fireworks season. Puppies should be socialized to all kinds of noises and experiences from a very young age. And those of us who adopt adult dogs also have a responsibility to help them learn to handle various noises. *Get my tips on how to help a dog who’s scared of fireworks. Click Here. What do I do if my dog is afraid of fireworks? There are some body wraps out there designed to fit snugly around the dog in order to make her feel secure. One is called the Thundershirt. Like some people, sometimes dogs also feel more secure when snuggled up. 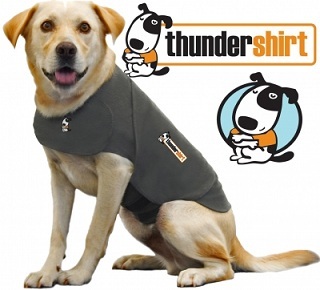 You may be interested in my post on the Thundershirt for dogs. The Thundershirt is not a quick fix. It should be combined with other training techniques and only works for certain dogs. 2. Use the fireworks as a learning opportunity for your dog. If my dog were afraid of fireworks, I would make sure to something fun every time I heard fireworks. I would bring out all kinds of treats and goodies like pieces of hot dogs or chicken and some tennis balls and play fetch in the hall or work on training, rewarding him for any calm behavior. I would ignore anxious behavior such as panting or whining and distract him with favorite toys, games, obedience training and tasty treats. If you absolutely have to take your dog outside for a quick bathroom break during fireworks or thunder, make sure you have a collar she can’t slip through. 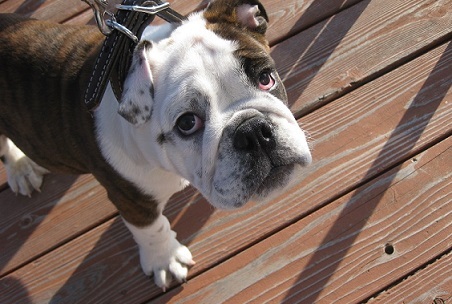 Dogs that are freaked out can easily slip through nylon collars, leather collars and even harnesses. Of course, make sure your dog is wearing ID tags. A good collar to have for safety is a martingale collar because it’s difficult for a dog to slip out. Get a martingale collar for safety here. A dog that is extremely anxious around fireworks can learn there is no reason to be afraid. It just takes a lot of creativity, time and patience. The more fearful your dog is, the more important it is for you to be a calm, relaxed leader. 3. Provide your dog with a safe, secure place to hide out. Allowing your dog to hide out in a safe place during fireworks will not help her overcome her fear, but it’s often the next best thing because a kennel or crate will keep most dogs safe. The safest place to put an anxious dog is in a kennel/crate. Fearful dogs are more likely to damage property, injure themselves or go to the bathroom indoors. This is just one more reason why it’s so important to kennel train your dog at a young age. If your dog feels secure in her kennel or in a small room, then it’s OK to let her hide out there for a while. Leave a radio or TV on and a fan to create white noise. Provide her with things to chew such as rawhides or Kong toys filled with peanut butter since chewing helps a dog relax. A stressed dog may also lick or bite at her paws, so if you can provide her with something good to chew on, she may not develop self-destructive behaviors. 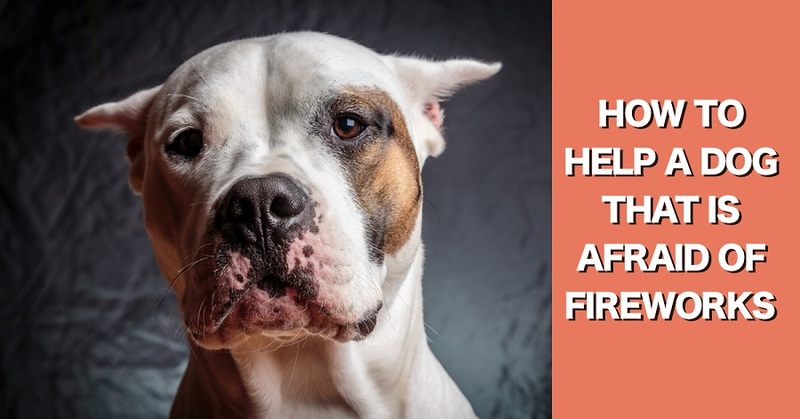 Also see my post: How to help a dog with EXTREME fears of fireworks for even more tips from a professional trainer. How do I get my dog used to loud noises in general? Here are some tips for desensitizing your dog to random, loud sounds throughout the year. Don’t start working on this on the actual Fourth of July holiday. That will be too much for most fearful dogs. 1. Very gradually expose your dog to loud noises. It’s not hard to find loud noises. You could carefully walk near a busy road with truck or bus traffic. Walk by a train, starting with several yards away of course. Give her many pieces of high-valued treats when you’re around these sounds. You could seek out people mowing the lawn. Or, ask someone to honk a car horn or to play a musical instrument. Ask someone to drop a large book or a can full of coins. Don’t try to scare your dog, but expose her to as many sounds as possible very gradually over time. Try not to respond to these noises yourself. Just stay calm and reward your dog for any calm behavior too. 2. Walk your dog in different environments. Walking in different areas will help expose your dog to new sounds. If you live in the country, walk your dog in the suburbs or the city where there’s more traffic, people and commotion. If you live in the city, go out in the country where there are different sounds like tractors, gunshots, farm animals or snowmobiles. Go to a lake where there are boats and jet-skis. 3. Act like the noise doesn’t exist. If you react to a noise, then your dog will also react. When you are trying to desensitize a dog to a noise, the best thing you can do is pretend you don’t hear anything. If your dog is scared of fireworks, don’t react to the fireworks yourself. Don’t even look at your dog. If you look at her, it shows that you expect a reaction. 4. Do not coddle your dog when she’s fearful. I’m torn on the whole idea of whether or not you can reward a dog’s fearful behavior. Fear is a real emotion and it’s OK to offer your dog some comfort. But, to help our dogs, we should try to encourage and reward calm, appropriate behavior. If you have to hold and cuddle your dog, that’s OK, but personally I would prefer to reward the dog for resting calmly on a dog bed next to me. 5. Don’t correct a fearful dog. I do not recommend correcting a very anxious dog when the cause of her anxiety is a loud noise. Yelling “NO!” at the dog, jerking her collar will generally make her more anxious. Instead, ignore unwanted behavior and praise your dog when she’s calm. Encourage her to lie on a dog bed next to you and praise any calm behavior. 6. Distract the dog from the noise with something fun. A tennis ball works great for distracting Ace when something “scary” is going on. He is slowly being desensitized to gunshots, and I do this by throwing his ball around and playing while someone shoots in the background. This helps Ace get used to the noise without focusing directly on it. We carry on with our game of fetch as though the noise doesn’t exist. 7. If your dog is very scared, try again later. It’s normal for a dog to jump at the sound of a sudden noise. Who doesn’t? But it’s not normal for the dog to remain startled. If your dog seems very scared, then slowly get away from the noise and try again later. Don’t run away quickly as though you are also scared because this will make the dog more anxious. Just walk away in a calm, controlled manner. Signs of a very upset or scared dog include heavy panting and drooling, pulling on the leash in an attempt to bolt or frantically trying to climb into the owner’s lap. Some dogs will bark or cry nonstop and others will begin to shut down completely. If Ace is afraid, he will lie with his tail between his legs, ears back, eyes shut and head on the ground. 8. Use anti-anxiety medication as a last resort. There are rare instances where a dog needs medication during fireworks. This is up to each vet and dog owner to decide, and there are pros and cons to each medication. You can also give your dog Benadryl for fireworks anxiety. Some anti-anxiety medications will cause dogs to feel confused and disoriented which can potentially bring out aggression. Sedatives can take a good half-hour or more to work and can affect the dog for hours after the fireworks display has ended. Some dog owners insist on using natural calming products for their anxious dogs. I’ve tried some of these with my foster dogs, and these products did not work for them. What an anxious dog needs most of all is time, patience and understanding. 9. Do not rush a fearful dog. Desensitizing a dog to a loud noise can sometimes take weeks, months or years. Do not push a dog too far or you will end up taking a few steps back. Many dogs end up being “gun shy” because their trainers pushed them too quickly and had unreasonable expectations. Every dog is different. Some are naturally more comfortable around noises and some take a long time to realize loud noises are usually no big deal. 10. Realize that training and socialization are never over. I’m always bringing my mutt Ace to new places so he can experience more. I want to have a dog that is comfortable in all situations so he can visit more places without making a scene. I will never be done socializing him to different environments, sounds, people and animals. but medication and each year she is less afraid. So something is working, probably my patience. have you ever tried sileo? You’d think it would also help that the other dogs act completely normal. This is a really good post. I know a lot of people have been wondering what to do with their dogs during the Fourth. Our neighborhood is actually quite firework-happy and we have fireworks throughout the year, especially a couple of weeks ago when the Blackhawks won. One of our dogs is completely immune to it and sleeps through anything, but our bigger pittie becomes alarmed. As things have been going off this past week we just act like nothing is going on and he’s been getting better. What do I do about my pitbull that just goes crazy biting doors and trying to jump through the glass door when she hears fireworks? Does anyone have experience with Thundershirts? I bought the Thundershirt for this Fourth of July, and it really hasn’t done anything. I have a golden who was abused, and she is scared of loud noises. My old girl Moca (yes, spelled Moca) was scared to death of fireworks and would wedge herself under the bed or some other odd place until they were over. She didn’t like loud noises in general. Poor doggie. Gus slept through them last year. I bet he will again this year. Thanks, Two Pitties! I hope your dog slowly starts to get used to the fireworks. Molly’s Mom, I have never tried a Thundershirt. I’ve heard mixed opinions. I’m guessing the work a little bit on some dogs. Ha! I also think Gus will sleep through the fireworks this year. What a funny dog! Ace doesn’t care about them either. I put a mat or blanket in the bathtub when my dog is shaking with fear and she settles down nicely on it. Interesting! Glad that helps your dog! Good to know the Thundershirt worked well for your dog, Sylvie, as well as just a regular T-shirt, kjp. Thanks for the info. Although Sephi still doesn’t like loud noises, thanks to training which uses the same tips as indicated in the above blog, Sephi is not as scared. What really works great is distracting her with something fun. Last night when the neighbors shot their fireworks, we played and did fun training for treats. She was completely distracted and did not run off and hide a single time. My sister had a dog with the opposite problem: she loved fireworks! She would get very excited and bark and try to attack the sparks. It was rather amusing. She was never hurt by them though. (I know, not a good behavior to encourage.) My dog mostly ignores them, but does give an occasional bark at the noise. Dawn, that’s great that you are able to distract Sephi with something fun. That usually works for Ace too if I want him to stop a certain behavior. He’s not really scared of anything, but he will get too excited about certain things. Amanda, Ace is not excited about fireworks, but that’s how he is with any kind of ball. When two people are playing catch it is so frustrating. I can’t have my dog outside with us if someone wants to throw the football (or frisbee or baseball) around without Ace either running back and forth obsessively or lying next to me crying and throwing a tantrum. I either have to take him for a walk or put him in his kennel (where he cries). We saw fireworks this year at one of our favorite ocean spots. There were a lot of people and some with their dogs. That worried me. We were far enough away from the actual launch that we couldn’t hear much noise, but many people near were doing their own. There were a couple super-loud ones (scared me!) and the dogs nearby were quite unhappy. It worried me because it was a rocky edge, and if they had jumped away from their owners, they could have fallen into the ocean. I don’t know what possessed these dog owners to have their dogs with them! Desensitization is good, but this situation was not appropriate for trying that! Cats are scared of fireworks too we found out. Oscar (our grumpy, grey old man) hid under the bed. We live on a lake now, and there were many loud fireworks all around us. He did not like! yeah cats can definitely be scared of fireworks. my cats seem to be OK with them. Our youngest cat Scout took a few years to get used to them but now he seems to understand they are no big deal. It’s a terrible idea to bring dogs along to watch a fireworks display unless they have already been desensitized to loud noises. Most dogs will cry and bark and disrupt the people trying to enjoy the show. my cat is not scared of thunder but my dog is. The best option, without a doubt, is to keep your pet away from fireworks and storms – anything that causes the dog anxiety. If it can’t be avoided, the original Anxiety Wrap for dogs is very effective in helping dogs cope with thunderstorms and fireworks. We have used this handy piece of apparel on our dogs for years, with great results. Of course, we also have sold tons of them on our web site (PupLife.com), along with the equally effective Thundershirt. Both of these will definitely help a dog with fear of thunder and fireworks. They are not a magic pill that makes your pet super happy, but they do help your dog relax a bit and make it through the night. But a dog can’t learn how to cope with fireworks and storms if they are constantly kept away from them. And it’s not possible to keep them away from storms anyway. Thanks for the info about the Thundershirts and Anxiety Wraps. People who say they don’t work probably expected them to be a magic solution. There are two types products that work for many dogs. One is the Thundershirt mentioned above. The other is DAP or dog appeasing pheromone. This is a compound that is put out by a mother to keep her pups calm and feeling secure for the first few days. 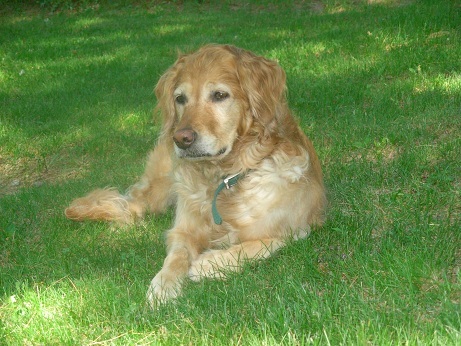 Dogs of any age are affected by DAP. You can get a collar, diffuser or spray. My dog is terrified of bangs since he got shot by a neighbor’s kids. DAP changes him from terrified to somewhat unhappy. He no longer hides in the shower, shaking uncontrollably during thunderstorms. Most dogs are affraid of the unknown when loud noises are involved. Turn on a radio or other source of music to add background noise. “White noise” like a radio or a loud fan or air conditioning does help to drown out potentially scary sounds like fireworks. Haha. I’ve tried watching a movie on the 4th of July at top volume until I had a headache. It worked for about 20 minutes on the dog then she realized what was going on and went into her usual stress mode. Thanks for the blog. My dog Ace is a guard dog but is scared of fireworks. He looks for a place to hide. My other dog, Sky, would stay outside and not really be bothered. What could I try for Ace? I would walk him, but I don’t think that will be a good idea. Thanks. If you are not comfortable taking him for a walk while there are fireworks going off, I would distract him in the house with other activities. Work on some commands while rewarding him with his favorite treats (chicken, hotdogs, etc.). Put him on a leash and practice heeling around the room. If he loves to play fetch, then do that. Just use what you can to distract him from the fireworks. Ignore the sound of the fireworks yourself as though you don’t hear them at all. This will help him see there is no reason to react and nothing to be fearful of. Ignore his anxiety. Reward when he is calm. Try visiting http://www.soundtherapy4pets.com and looking at the Sounds Scary CDs – brilliant 2-disc set with a comprehensive training manual. Check out the testimonial page, too. DAP can also help. My dog is extremely scared of fireworks as well. I discovered that a week ago. She is, generally speaking, a sensitive dog. She has always has been scared of things like big trucks or people showing up at my doorstep, but she has always enjoyed walks. Walks actually used to be her favorite part of the day. Unfortunately last week some fireworks were set off near our place and while we were out she panicked and frantically ran towards our house, with me holding on to her desperately from the leash. Now she refuses to leave our house and go out for what used to be her favorite activity. Since this happened a week ago, I am hoping it is not too late to fix it. I am just not sure what to do. She doesn’t respond to fun activities while being scared. Luring her out of the house with her favorite toy is not working and neither do treats. Her fear has also affected her daily behavior. She is now much more subdued. She does not engage in any playing activities in the house and reacts badly to all noises. Note that she is a trained dog, meaning she has received training by a professional. She responds well to my commands, even at her worst state of fear but I do feel sorry for her. I love her to bits. Is this a tough case? Is she a large dog that is difficult to control? I would just get her out for walks every day anyway. Don’t react at all to her feelings of fear. Just pull her out the door and once you’re out there, act all excited and maybe start out by running a few blocks. Take her to her favorite parks – drive there if you have to. Or drive a few blocks away and then get out and walk home and walk around your own neighborhood just to change up her routine of feeling scared to leave the house. Bring favorite toys along. Get someone she likes to run ahead. Bring her favorite food. And don’t push it too far. Try to end the walk when she is feeling happy and secure. Try to end the walk before she tries to run home in fear so that behavior doesn’t get reinforced. Do not try to reassure her. Do not pet her or comfort her. Doing so will unfortunately communicate to her that there is indeed something to be scared of and you will be rewarding the behavior. Yes definitely don’t let the dog rule things through her fear. Force her to go for a walk everyday and I bet within a week she’s okay again. Somehow she’s now associated going out with that loud scary noise and by making her do the action over and over with no bad consequences will reset her mind. Yes, she is a massive dog – collie, husky-cross breed and used to be hard to handle prior to her training. After trying a number of approaches, I felt that she would steadily let go of her fear if she had less challenges to face. I walked her a couple of times at 2 a.m. when it was quiet outside and slowly reintroduced her to our former routine. She is still scared, easily irritated and hard to handle but at least we are getting there. She has also started eating regularly again and seems much more playful. Insecure dogs are often hard to handle and require tons of patience. But surely ignoring them when they are irritable and rewarding them when they have reached a calmer state of mind seems to be the trick. She’s lucky to have you! Thanks for being so patient with her. I’ve lived with a few insecure golden retrievers. For my dog Brittni, coming across anything new was an event. She was scared of a lot of things and almost always nervous. You don’t have a Chihuahua, do you? I have a black lab mix. wow. just horrible advice. half of it will result in you just terrorizing your own dog with “noise treatment” that will never cure a truly terrified, full on panic attack some dogs get with some noises. and it can come out of nowhere. we had a fearless dog (fireworks, thunder, street traffic, never even noticed it because he practically lived outside on our covered front porch first 4 years of life – would have to practically drag him in during thunderstorms he didn’t want to miss anything that went by) that just randomly freaked one 4th of july and lived in terror the rest of his life anticipating noises. we’ve had 5 dogs over 20 years. two (not alive at same time) were terrified of fireworks, then it drifted off into any unexpected noise. the ONLY thing that works in severe cases are MEDS. one dog you could probably light a firecracker right on his head and he’d yawn. other two didn’t mind but occasionally jumped at intense lighting clap or firework. but two dogs that become officially terrified where nothing you do calms them down, nor any of these things work (the old pretend there’s nothing going on so ignore their terror….yeah right that one is real effective lol). we literally did all things on this list and other things advised. the ONLY thing that works are anti-anxiety pills. if it wasn’t a close sound you could close windows and play loud music/tv and he’d think the threat had passed. but close-by fireworks (then it became thunder) would lead to raw sheer panic that would lead to full on shaking for hours and hours and hours while trying everything to escape the house (and the normally safe dog cage (a.k.a. “in the womb” den/nesting) he’d love would become terror zone of him scratching and biting like a mad man for hours and hours and hours while you acted calm/unconcerned like there’s absolutely nothing going on like firecrackers or thunder so. as experience vet will tell you, you need to be very careful not to overdose if it’s small dog so first few times only give a tiny bit until you see small result. then tiny bit more until you know which amount has him napping happy during 4th of july. we had one little one you could give him a full pill once he started full on freaking out (had to open his mouth and force it down) and he go to very peaceful deep sleep for hours on end (mostly sleep but a few hours of shake off time and he was never allowed outside during that time) and he was never again having to experience sheer terror like he would. 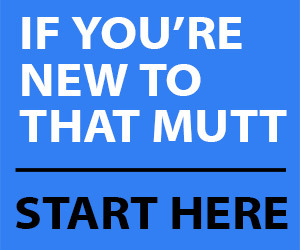 this above advice is just foolish for true panic stricken dogs that get that way through hearing upsetting noises. and it’s just pure opinion and that’s all it is. work with a reputable vet and show him/her video of the extent of terror. a good vet (not a pill pusher) will know just what you need. and like our little guy…he started putting two and two together and he came out of his medicated 4th of july looking at us like “THAANNNK YOUUU!!”. wagging his tail like “i made it through another year!” a little hung over but bouncing fun off the walls happy the next day back to normal. Of course medicating the dog works. I would rather not medicate a dog unless it’s an extreme case. I would rather help desensitize the dog to the noise – loud noises are a part of life. I believe that your approach and your enthusiasm in medicating dogs sensitive to loud noises has somewhat resulted in ignoring the reasons why I posted on this page (funny, you seem to be the only one). Although I do agree that in a case of loud noises such as a firework display, some mild sedatives can help towards aleviating or avoiding altogether the panic, the problem is not what to do with your dog at THAT time, but what to do with your dog once it exhibits some sensitivity in its every day life. First of all, you cannot possibly predict when your neighbour will decide to toss some fireworks or when thunders will be loud enough to scare your dog to rush to the cupboard and go fetch the pills. Yes, it may be advisable to medicate your dog on the 4th of july, however, in the case of my dog for example she has associated the fear of noises with the outdoors. I presume with your medical background dear notsosure you have been exposed to the concept of fear and its complexities. It may carry various associations, might be related to a dozen of factors and in each case its fabric may also vary. My dog feels secure in her own house, in her own controlled environment and she can cope with loud noises if she is in it, but panics if a loud bang happens when she is outdoors. I coulnd’t possibly think of medicating her 3 times a day just to take her out on our normal walks so she won’t poo in the house. Hence some form of positive rehabilitation needs to take place in order to reintroduce her to our former routines and remind her, or enhance her experience of the outdoors as something pleasant and exciting. Now as I have mentioned already, walking her late at night has helped. Walking her together with the neighbour’s dog, which is a fisty one and generally challenges a lot has also helped, since that dog keeps her focused on the ‘I will pee more trees than you’ contest ignoring thus little noises that might trigger her fear. This is called rehabilitation. It is very important to not let the fear take over every part of your dog’s life. I do accept that in some cases when there is a noise breakout medication can help but apart from these moments, the dog needs to run a normal life. So instead of having a dog who runs scared to the nearest wardrope to hide every time someone bangs his/her car door outside I prefer to have a dog that ignores or rather accepts the existence of such noises. And I believe this page is trying to contribute to the ways in which a postive training such as the one described above can take place. Well said, Claire! I appreciate your contribution to this post. Very good advice! I’ve said it before, but your dog is very lucky to have you. So, you’re going against advice to keep dogs in during fireworks by recommending going *out* for a walk? Even though it’s been proven that frightened dogs can easily slip ANY collar? And that their hearing is so much more sensitive than a human’s is, so you’re effectively taking them out where it’s louder and deliberately trying to damage their hearing? “Some people do not have the time or energy to work with the dog” This is extremely rude and judgemental! The fact is, fireworks should NOT be a normal part of life. Perhaps you’re suggesting that we should learn how to train wild and farm animals while we’re at it as well? Of course they shouldn’t get frightened. Why should an animal be frightened — it’s just a behavioural problem — if ignorant humans let off explosive devices in their presence. What rot! My dog is perfectly calm for traffic, people dropping things, blah blah. They are normal and not generally hearing-threatening noises, and they happen often. Bear in mind that fireworks are loud enough to damage human hearing! Please, don’t take everything Lindsay says as being the best way to handle scared dogs! Of course it is safer to keep dogs inside during a storm or during fireworks. Of course it is safer to leave them home rather than take them hunting. 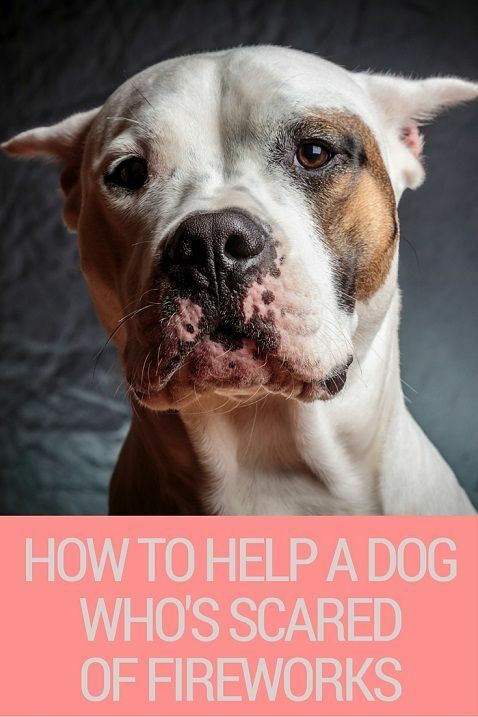 But some people wish to desensitize their dogs to these noises, and in those cases I would absolutely recommend exposing the dog to these sounds. Each owner has to make his or her own judgement. Yes, it is possible for a dog to slip through any collar. Use common sense. Yes, exposing a freaked-out dog to more noise could just make the problem worse. But slowly exposing the dog to these sounds and helping the dog associate positive experiences with them will help the dog grow as an individual. Should we take our dogs to a fireworks display? Of course not. If we hear fireworks far away, would it help some dogs to go outside and do something fun? Absolutely. My German shepherd has always been scared of fireworks, gunshots, loud vehicles, nail guns, hammering – you name it – any noise. I feel so bad because he starts to chew on wood and makes his gums bleed. So I bought him a muzzle. He’s also a jumper. He gets out of his chain and jumps the back fence. Then I have to go get him. What can I do because he gets so nervous, poor thing. I have a female shepherd but she doesn’t react to the noise at all. But he does, and goes crazy. Please help me. What can I do? I have an outside dog and she is scared of fireworks so bad that she finds a way of getting out of her kennel and runs off. We are usually gone on the Fourth of July. I was just wondering what we can do to help her be calm and not get out of her kennel so we don’t have to keep trying to find her each year. Please help. Kelli, I think it might help if you get your dog inside. Dogs are supposed to be inside dogs, unless you have a really good reason for your dog to be an outside dog. Leave her indoors on the fourth. Sometimes we give a calming solution for dogs in their water. It’s clear and they never know it’s in there. But your dog is a different. Ignore what I said before about her being an outside dog because I didn’t see the kennel part! I have an idea not yet mentioned on here. I thought about going on YouTube and watching firework displays really quietly to start with. And doing it a few times every day, increasing the volume each time. Just leaving it running in the background while I go on with normal everyday activities (perhaps mix it with rewards for calm behavior and do some training too). Do you think this could work? To the author: If you can’t play ball without your dog trying to join in it can be hard work. I trained my last dog to carry around a tennis ball or other toy if he wanted to play. He can only join in if he brings his toy and runs around with it in his mouth. He got the idea in the end and then everytime I would get my football out he would run and get his toy ready to play. He would still chase around after my ball but him carrying his own ball around would slow him down and also stop him trying to take our ball. Try it. Hi. I have a small dog called Bailey. He’s 6 years old. Every year since he was a pup he’s been very frighted of fireworks. I’ve tried everything. I turn up the TV. He goes nuts. He pees and messes and makes himself sick. I have tried medication in the past and nothing works. When I got home from work today, I found him in my bottom drawer. I love him, but I’m dreading tomorrow. Can you help, please? I will try anything! Many thanks. Hi. My dog Meg sits and dribbles when fireworks go off. She’s stressed and shaky until we bounce a ball, then she’s fine. I’m going to try the T-shirt trick and see if it works. Thanks for the tip! So I tried desensitizing my dog by playing fireworks sounds on YouTube, but it scared him and he ran upstairs, even if it was quiet. Strangely though, he doesn’t bat an eyelid at explosions and so on the TV. When the fireworks really get going my dog shakes and hyperventilates. He looks really sad and hides under anything he can get under. We found it was generally best to have the TV on loud and try to carry on with our normal activities. Sometimes it helped him to calm down. When he really struggled we put his bed in the corner of our corner couch and he curled up with us. Eventually he settled a lot better than if we sat on the floor or tried to comfort him. One more thing which seemed to work really well was something particularly unexpected. Say “walkies,” get his collar and lead and get him ready for a walk. Don’t over do anything or make any special allowances for the noise. Just go through your regular routine. I did this and he was so excited for a walk, he semi-forgot about the fireworks (or the walk was more important). And being outside seemed to help him loads. Perhaps he is mentally familiar with loud noises outside so it didn’t affect him as badly as hearing them inside. Then after the walk, I let him in the house with his leash on and leave the door open as the noises continue. Wait til he settles down. Then after about 5 or 10 minutes, I close the front door. Let me know if it works for you!